A Breton farmer, Joseph Baron, is being pursued by the government for over a million in euros in damages for an attack on an “ecotax” highway portal. Supporters joined Baron in the courthouse, and also carried banners outside. They have also formed a support committee and are raising funds to assist him. 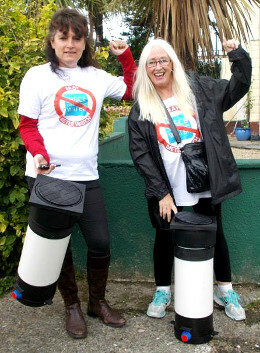 Activists with Bray Water Meter Watch captured two junction boxes that workers intended to install to facilitate the metering and taxing of residential water service. They held the boxes hostage until the workers reinstalled the old, unmetered stopcocks and repaired the torn-up sidewalk. War tax resister Pepa Pretel, under threat of having her home seized and sold by the government, gave in and paid the amount due. She says, however, that “the important thing is that people know that there is this disobedience.” Pretel was one of several hundred people in Spain who redirected a percentage of their tax bill, equivalent to the military percentage of the Spanish government budget, to charitable causes. “These resources wasted in the preparation for war, could be redirected to satisfy the basic necessities of the people and to promote egalitarian and nonviolent values that surpass the values of fear and aggression promoted by the military system we suffer from.” She says that despite the setback, she plans to continue resisting. The Journal of Journalists (or something like that, it’s Greek to me) wrote up a backgrounder highlighting some historical tax resistance campaigns from around the world. 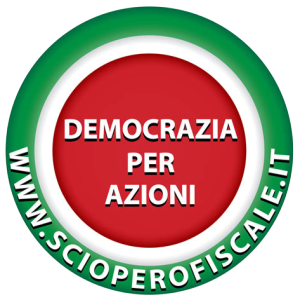 The “ΔΕΝ ΠΛΗΡΩΝΩ” (Not Paying) movement has launched a political party. In our last, we stated that two excellent gates had been thrown over the garden wall of Mr. Pain, from St. Woollos churchyard. We have since heard that these gates, and some others, were stolen from premises in the vicinity of Bryn Hyfrid, the residence of Mr. L. Edwards, and that a similar gate was discovered in one of the fields of that gentleman. There is no doubt but the witless and wanton fellows who committed the outrage, were impelled thereto only by a spirit of mischief, or a desire to plume themselves on deserving the title of Rebeccaites. We understand that a special general meeting of the trustees of roads is announced for the 13th instant , at Brecon, for the purpose of considering the justice of discontinuing twelve toll gates. We should much like to hear of an announcement of a similar meeting near Newport. Rumney and Caerleon gates are subject of grievous complaint. Tax resisters are rioting in Brittany, and forcing French president François Hollande to back down again and again on his plans to introduce new taxes. Recent tax resistance news from France, Thailand, Tijuana, Tanzania, and Oregon. You can now download from the I.R.S. the information it collects about you. Also: more tax resistance news from France and Argentina. International tax resistance news from Kenya and France. Also: the proprietors of the True Sun found in 1833 that the Whigs, who had been swept into office on a wave of tax resistance, were nonetheless not going to be tolerant of any more of it as long as they were in power. Farmers in Brittany torched a tax office last week after a judge sentenced eleven bonnets rouges to prison terms for participating in the destruction of highway tax gantries. In the 1860s, the New England Non-Resistance Society debated tax resistance, a debate they were unable to resolve and one that we still wrestle with today. I threw together some graphics that give a birds’-eye historical overview of the various war tax resistance movements and groups in America, the timespans they were active, and the wars that most concerned them.